The Prolux Hardfloor Cleaner, As seen on TV! This buffer gives you the the capability to quickly clean, scrub, polish, buff, wax, and shampoo. From cleaning floors to scrubbing tile to polishing floors the Prolux Hardfloor Cleaner is designed to do it all. With its 2 year warranty, simple to use design, and multiple cleaning attachments it is designed to be one of your most used appliances. It uses different cleaning brushes from aggressive pads to fine polishing pads. Lightweight and powerful, the Prolux Hardfloor Cleaner is highly versatile and built to withstand many years of cleaning and polishing the floors in your home. The Prolux Hardfloor cleaner cleans all hard floor surfaces! It polishes and cleans Hardwood or Pergo. It sprays cleaner and scrubs and cleans tile and tile grout. It sprays and mops all hard floor types. With its 6 included scrubbing pads it cleans, sprays, cleans, polishes, buffs, waxes and wipes nearly any hardfloor surface. With its 2 year factory warranty it is designed to clean any hard floor surface in your home or small office. MOP MODE - The user may enable the Mop/Spray mode with a push of a button. Then the unit gently sprays out the cleaning chemical (or water) of your choice to clean nearly any surface. So not only is this a very effective tile and grout cleaner but it can be used as your daily mop as well. This can also be used to wax and buff your hardwood floors (read owners manual first)! 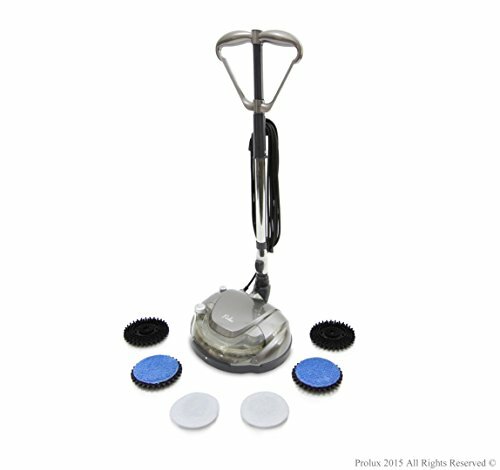 POWERFUL- A 400 Watt 120 Volt motor powers the 2 scrubbing/polishing pads. WARRANTY- The manufacturer Prolux provides warranty of this Appliance for a time period of 1 year on the appliance and 2 years on the motor. WARRANTY - This is covered by the Prolux Factory warranty for a time period of 1 year on the appliance and 2 years on the motor for household and light office use. SPECS - Includes a Powerful but quiet 400 Watt 120 Volt motor, 25 ft power cord, telescopic wand for different heights of users, and ergonomic handle (which folds into a buffing T handle) which allows you to clean large areas while remaining comfortable.